Some artists are bad at sports, some artists are good sports. Feminists are artists. Some mothers are feminists, some artists are feminists and mothers. As mammals, we’re all born from mothers. Mothers and mothering make the world go round and keep the wheels of life spinning. And life is messy—it’s full of bodies that ooze and wheeze, splatter and spurt. Solid, liquid, and gaseous, bodily matter creates a viscous sphere of reality for mothers and motherers from pregnancy and childbirth through infancy, childhood, and on to the grave. Photos by Lise McKean unless otherwise credited. Curiosity about properties and behaviors of matter and the manipulation of it, whether playful or null-hypothesized, are hallmarks of artistic and scientific creativity. How about cutting it in half, smashing it, or welding it together, turning it upside down, making it bigger or smaller, louder or quieter, hotter or colder, lighter or darker? The decision-making rolls on from one work to the next. Of course artists don’t have to be mothers to be interested in exploring embodiment and connections to others. The impetus can come from loving a partner or a pet, teaching yoga, being ill or caring for someone who is. That is to say, any artist can make the decision to foreground the exploration of bodies and connections between them. Large cadres in the realms of institutional art—museums, art schools, commercial galleries—evince a phobia about these interests. An artist coming out as a mother or motherer makes some folks positively squeamish. Especially those who perpetuate machismo conventions that transmute art work into commodities. 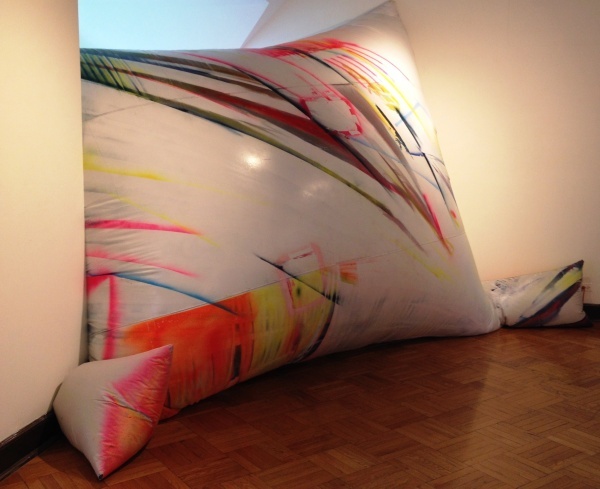 Surface and Beyond (2014), installation shot. Photo by Claire Ashley. Like any other strong lineup of shows, this lineup features work variously engaged with abstraction and figuration, forms and materials, scale and dimensionality. The works in these shows embody their makers’ irrepressible determination to create art that enlivens the space it inhabits. In this regard, the recent installation of Judy Ledgerwood at the Graham Foundation, Indira Johnson’s mushrooming Buddha heads, and Sabina Ott’s current exhibition at the Chicago Cultural Center also come to mind. Let’s start with Claire Ashley and Cameron Harvey’s show, The Surface and Below, curated by artist and mother-to-be Angela Bryant. 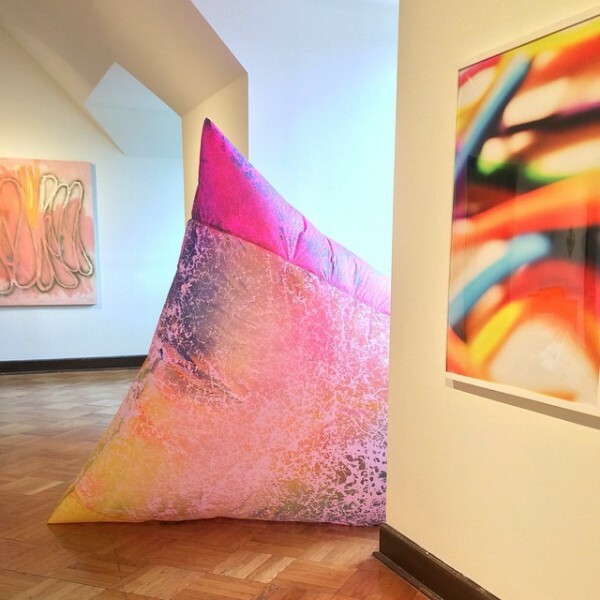 The works in the gallery’s almost demure manorial space twist and shout with blazing color and pneumatic girth. 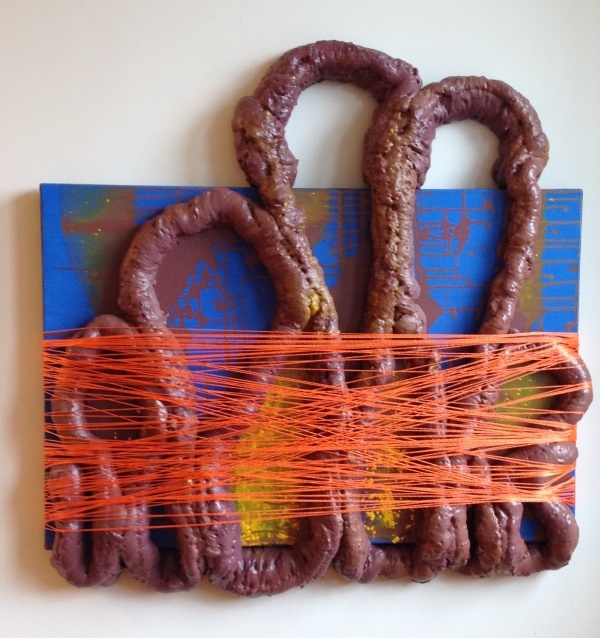 Harvey affixes spray foam, string, and spandex onto her painted canvases. These materials are more than another form of mark making. They transform the canvas into a sculptural object. Sometimes the foam takes leave of the motherboard altogether and takes on a life of its own. With or without a canvas, the works at once suggest gestural abstraction and forms as familiar as a vacuum cleaner hose, sea slug, entrails, or excrement. With her distinctive melding of ideas and materials, Harvey’s debate with figuration and abstraction becomes altogether visceral. The work of either Harvey or Ashley would more than suffice for a solo exhibition. Yet seeing them together adds the context of contrast, and creates a dialogue between the two bodies of work. Ashley’s air-filled creations are made of ripstop nylon and PVC (polyvinyl chloride)-coated canvas tarpaulin. She spray paints them in funfair colors. What’s more, some are attached to a wearable backpack that holds the air supply. This means they can be literally embodied. 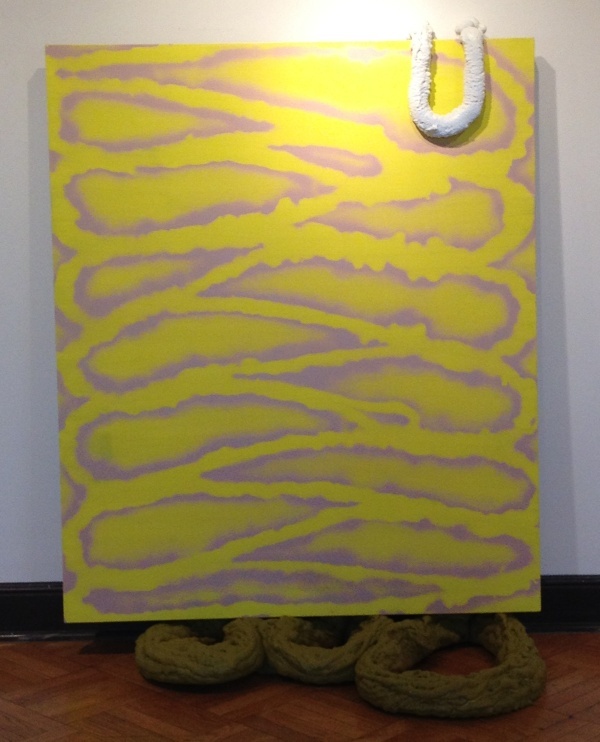 Whatever way they’re deployed, Ashley’s works play nicely with Harvey’s spray foam and summertime palette. Harvey’s string-wrapped foam forms and Ashley’s inflated ones—along with her small soft creaturely figures crammed through holes in plywood—all proclaim a showdown between exuberance and constraint. Ashley’s bloated forms are way larger than life and billow like the canvas of a pirate ship at full sail. Two of them bulge out of their alcoves. The larger one is an assemblage that resembles a pillow with armrests known to New Englanders as a husband. Ashley’s digital prints hang nearby with festive blurs of color. They’re the result of another approach to scale and space: she makes tiny objects out of colored clay, photographs them, and blows up the photos. Their flatness punctuates the puffiness of the objects that engorge the gallery. Moving from the leafy enclave of River Forest to the urban streetscape of Division and Milwaukee brings us to Edra Soto’s show, Say Everything. 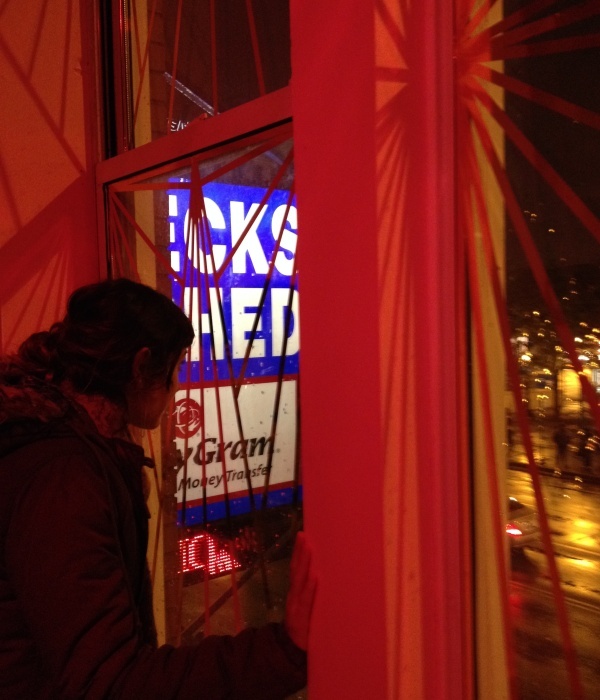 Walking into her installation on a miserable cold night felt like coming to a tropical beach at sunset. Spotlighted in a room purring with coral-pink light, greenish silkscreen banners hang from the ceiling. 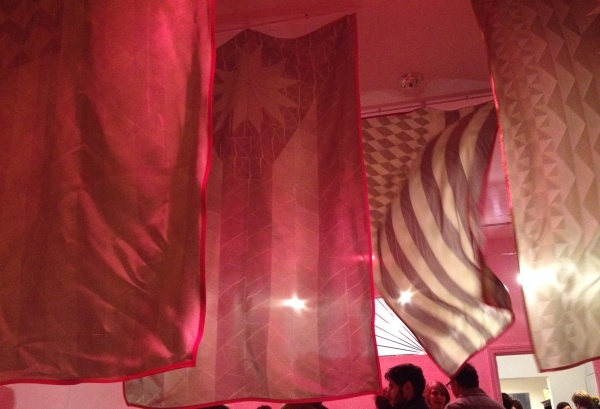 Geometric motifs from the flags of the US, Puerto Rico, and Chicago repeat themselves across the fabric, at once rhythmic and heraldic. With fans positioned around the room, the banners undulate creating the sense of rustling palms and rolling waves. Soto extends her beach references by taking PVC stalwarts—molded plastic chairs—and covering them with jungleprint towel-tapestries that are sold further west on Division. Yet Soto’s work isn’t for just for lotus-eaters. 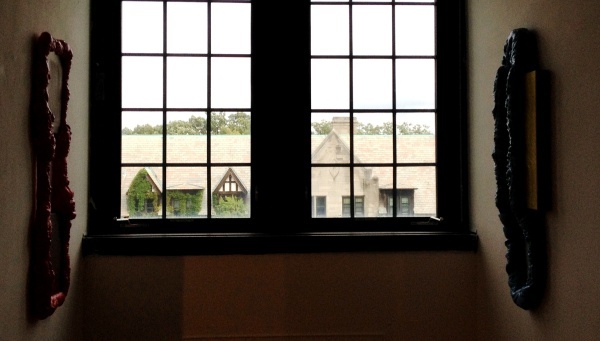 Her rays of tape on the windows draw attention to them and the world beyond the gallery. 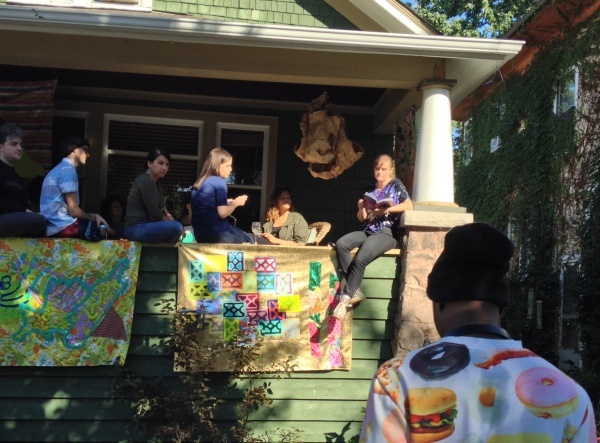 Queen Bee: C.M Burroughs reading; Krista Franklin, Beez in the Trap (2014), hanging sculpture. Next on the lineup is Queen Bee at Terrain. 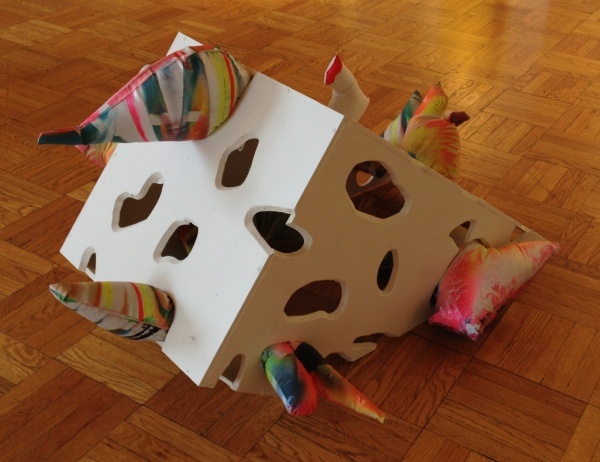 Curator Allison Glenn brings together work by visual, literary, and performance artists. Her essay sets out ideas coursing through the show—identity formation, rhizomatic forms of interconnection, and non-hierarchical collectivity. In relating these ideas to feminism, she takes pointers from Nikki Minaj’s 2012 single, “Beez in the Trap,” and artists associated with the Feminist Art Program at California College for the Arts during the 1970s. Victoria Martinez, Bandera M (2014), hanging in front of porch. The visual art engages with Queen Bee’s formal and conceptual concerns: Victoria Martinez’s found objects transformed into flags; Krista Franklin’s wearable sculptures of handmade paper, gold leaf, synthetic hair and acrylic fingernails; and Erin Minckley Chlaghmo’s elaborations of organic forms into kinetic patterns. 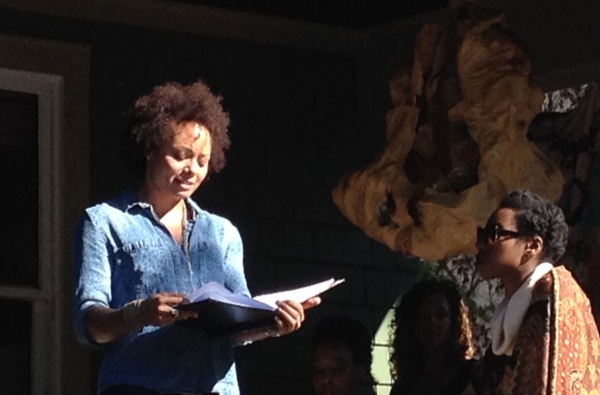 On September 14, the art works doubled as sets for Terrain’s front porch stage that featured compelling, i.e., kickass performances by C.M Burroughs, Lise Haller Baggesen, Reshayla Marie Brown, and Krista Franklin. The day’s closing performance, a reading by Baggesen from her recent book, Mothernism, left listeners with no doubts about the glass ceiling and other things broken by Margaret Thatcher and her cronies. And if you missed these performers, take heart. They’re Chicago artists with more shows to come. Whether it’s called mothernism, tidal wave feminism, or any other name, the need for it is born again with each generation. When contending with motherfuckers, sibyls of corporate success say lean in. These Chicago artists take a different stand: they use mother wit to make art and space for it—and then invite us in to play. Lise McKean is an anthropologist and writer based in Chicago.